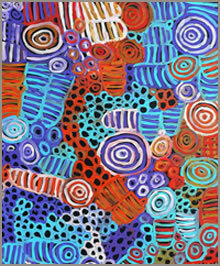 Betty was born c.1954 in the Utopia region of the Northern Territory. Betty Mbitjana is the daughter of prominent Utopia artist, Minnie Pwerle. 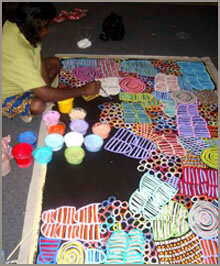 Betty paints with a rich array of colours and her work expresses a compelling visual and spiritual power. All the stories she paints conveys her deep connection with the land, and knowledge of the foods that it provides. 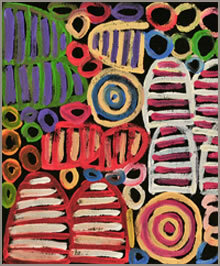 Betty’s renowned works portray Dreamings involving the"Bush melon" bush melon, and bush melon seed, types of bush tucker traditionally used by her people, once very common, and becoming increasingly rarer. Aboriginal women used to collect this fruit (that was green in colour and then ripened to a brown colour) and scrape out the small black seeds. They would then eat the fruit straight away or cut it into pieces and skewer them onto a piece of wood and dry them to be eaten in the coming months when bush tucker was scarce.